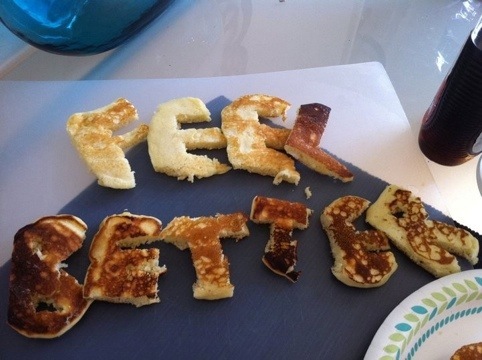 Doesn’t food just seem to taste better when it is in a shape or better yet, spells out a message? 🙂 I made these a few months ago when Danny was sick. We have fallen into a routine of having pancakes every Saturday morning and I figured this would be something a little different! I would like to point out that I do not have any letter-cookie cutters, hence the free style shape of each pancake…but it’s the thought that counts, right? I do love trying new things with pancakes (chocolate chips, peanut butter, etc) and he likes just plain buttermilk. I think I am going to get some cookie cutters so I can make different shaped pancakes in the future. What is your way of spinning a creative twist on pancakes? I saw this guy on Rachel Ray one time who added food coloring and other colored ingredients to his pancake batter and put it in a squeeze bottle (the cheap clear ones). Then he drew all sorts of things on the griddle withe the batter. He ended up having pancakes in the shape of a flower in a flower pot. It was so cool. that sounds awesome! im definitely going to try that. ill let you know how it goes.